The five-day humanitarian ceasefire in Yemen has ended with the resumption of Saudi-led air strikes against Houthi rebel positions, despite United Nations envoys’ calls for an extension of the truce. 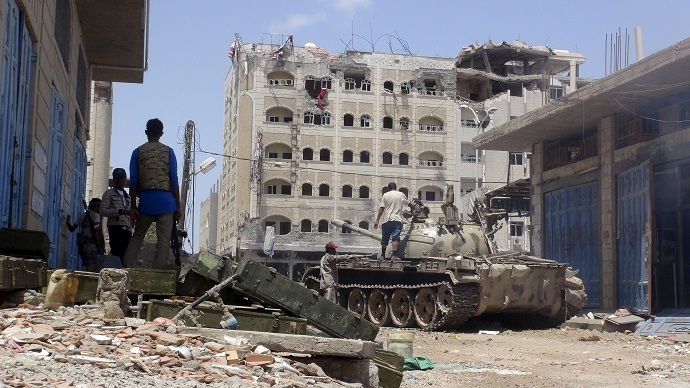 Coalition airstrikes hit rebel positions and tanks in several neighborhoods of the port city of Aden, Yemeni security officials told the Associated Press when the ceasefire expired at 11:00pm on Sunday. “They began bombing Aden a few minutes ago,” an army commander loyal to former president Ali Abdullah Saleh confirmed to Sputnik. Reports from the ground said explosions could be heard near the airport and the districts of Khor Maksar and Crater. Air raids have allegedly hit the Houthi-held presidential palace as well as a military base military officials and witnesses told Saana. The bombardment resumed despite UN calls to extend the humanitarian pause which has largely held in the country since. The UN call for peace comes as Yemeni political parties gathered in the Saudi capital Riyadh in search of a political solution to the crisis. Houthis, the main rebel fighting force on the ground, however decided not to send their representatives as some 400 delegates including ousted President Abedrabbo Mansour Hadi took part in the talks. While tribal fractions seek stability, the UN World Food Program (WFP) said that getting aid into the country during the five-day pause in fighting was largely successful. The agency was able to deliver vital food, fuel and medicine supplies that were needed in Saudi-blockaded Yemen. UN estimates that conflict in Yemen has killed more than 1,400 people, many of them civilians, since the Saudi-led air campaign began in late March.